The Tianjin port city is located in the north-eastern regions of China. It is divided into two parts with distinct characters. The new urban part lies on the Bohai Gulf and is an ultra-modern area with tall skyscrapers. 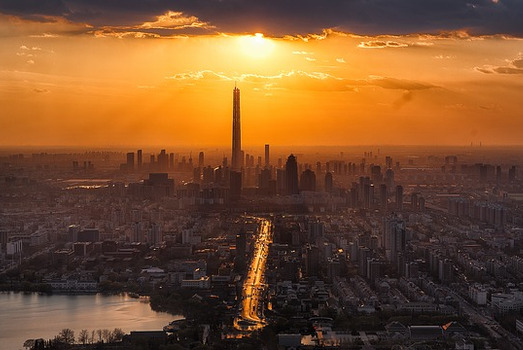 The Tianjin Radio and Television Tower is an iconic building with a height of 415 meters. The old city has still retained its ancient look. It is located on the banks of the Hai River where the Yangtze and Yellow Rivers are connected by the Grand Canal Irrigation System. The terrain of Tianjin is mostly flat and swampy along the coast. While the north is dominated by the Yan Mountains along its border with Hebei Province, the highest peak being Mount Jiuding at 1,078.5 meters above sea level. Tianjin Municipality has hot humid summers and cold dry winters. The July (summer) temperatures reach a maximum of 27oC and the minimum can go down to a freezing -23oC in January (winter). Of the 13 million population of Tianjin, the majority are Han Chinese with a small percentage of ethnic minority groups like Hui, Manchus, Koreans, and Mongols. Almost 40% of the land is covered by farmlands. Agriculture is a major occupation with large-scale production of wheat, maize, and rice. Fossil fuels, salt, manganese, and boron are the other products of the region. The air, road, and metro transport systems are very modern and efficient. The Tianjin Binhai International Airport Terminal is connected to all the provincial capitals of China and major cities overseas. The Port of Tianjin is an International port of call for cargo ships as well as large passenger cruise liners. Some of the popular sites are Huangyaguan Great Wall, Dagu Fort, Mount Panshan, Eastern Qing Tombs, Tianhou Palace, Tianjin Museum, The Porcelain House, Eye of Tianjin, Shuishang Park, Tianjin Ancient Cultural Street, and more. Tianjin cuisine focuses on seafood and stews. Some of their specialties are Goubuli Baozi steamed buns, Tangdui fruit dessert, Chatang soup, ear-hone fried cake, Tanghulu sweet dish, Tianjin preserved vegetables, etc.